Bittersweet Farms has opened the Bittersweet Center for the Community at the Sylvania Historical Village on Main Street in downtown Sylvania. The Bittersweet Center for the Community (BCC) will act as an additional site for the Bittersweet Day Program, as well as a space to showcase the work of Bittersweet artists and local artists. The BCC will be open Monday through Friday from 10:00 a.m. to 2:00 p.m. beginning October 31, as well as Small Business Saturday, and Miracle on Main Street. For 33 years, Bittersweet, Inc. has been successfully serving adults and adolescents with Autism Spectrum Disorders across four locations in Ohio. 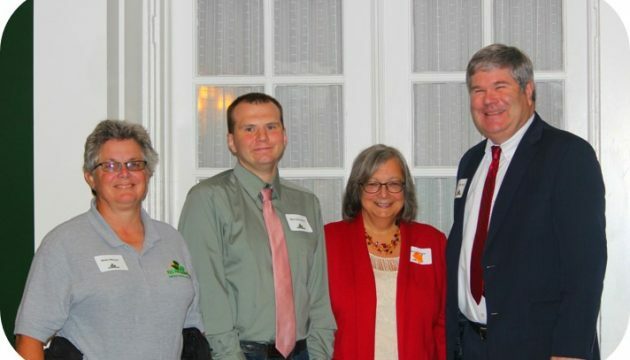 Pictured above, Beth Meyer, Ben DeVorss, Robert Solt (President of the Board), and Vicki Obee (Executive Director), at the Bittersweet Donor Appreciation Dinner. For more information, visit www.bittersweetfarms.org.